Vanilla extract is a flavour solution extractes from vanilla pods in a solution of ethanol and water. To produce high-quality vanillin as aroma, flavour and fragrance component, an efficient, yet mild extraction technique is required to prevent decomposition. Ultrasonic extraction is a mild mechanical extraction method, which gives high yields of vanillin in a very short extraction time. As the second-most expensive spice after saffron, vanilla production requires an efficient extraction method, which prevents the degradation of the valuable essential oils. 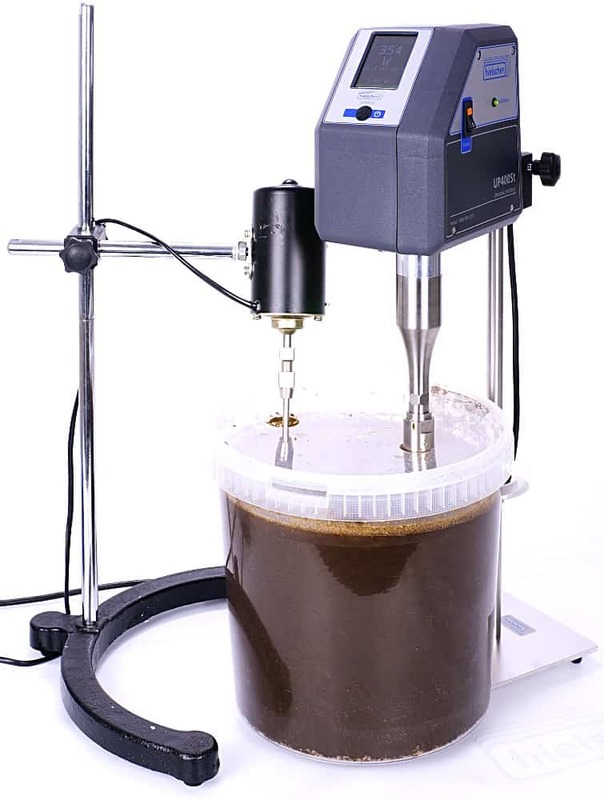 Ultrasonic extraction is well-known and established as a mild, non-thermal, yet highly efficient method to release bioactive compounds from plant material. Ultrasonic extraction is based on the phenomenon of acoustic cavitation, which is a purely mechanical treatment. This makes sonication the preferred method for the isolation of sensitive bioactive compounds such as flavours compounds and essential oils, e.g. vanillin, polyphenols, or antioxidants from botanicals. 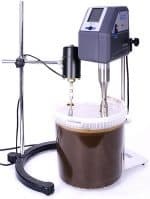 Batch: Ultrasonic extraction processes can be operated as simple batch processes or as inline treatment, where the medium is continuously fed through an ultrasonic flow-through reactor. Batch processing is an easy procedure, where the extraction is performed lot by lot. Hielscher Ultrasonics offers ultrasonic processors for small to large batches, i.e. 1L to 120L. For processing batches of 5 to 10L, we recommend the UP400ST (400W, pic. left) with sonotrode S24d22L2D. For processing batches of approx. 120L, we recommend the UIP2000hdT (2kW, pic. right column at top) with sonotrode RS4d40L4. Flow-through: For larger volumes and full-scale commercial extraction, a continuous liquid stream is fed through an ultrasonic reactor, where the solvent/botanical slurry is intensely sonicated. Jadhav et al. (2009) compared ultrasonically-assisted extraction (UAE) and Soxhlet extraction. The research confirmed that ultrasonic extraction intensifies the release of vanillin significantly when compared with Soxhlet extraction. 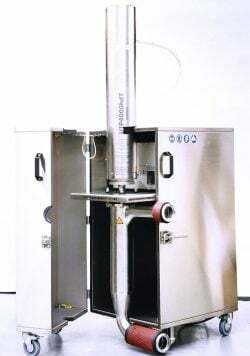 The Soxhlet treatment required operating temperature of 95°C, solvent:solute ratio of 66.67ml/g and a extraction time of 8hrs resulted in release approx. 180ppm vanillin. Ultrasound-assisted extraction (UAE) required only 1hr to release approx. 140ppm vanillin using the same solvent:solute ratio at room temperature. Rasoamandrary et al. (2013) compared the efficiency of vanillin extraction using a 100W probe-type ultrasonicator (e.g. UP100H), an ultrasonic bath, and a hot water bath. The researchers concluded that the probe-type ultrasonicator is a powerful extraction tool due to its high intensity ultrasonic. Therefore, the probe-type ultrasonicator outperformed the alternative extraction methods by giving similar/or higher yields of vanillin extracted in a significantly shorter extraction time and less solvent (i.e. ethanol) consumption. The comparison of the three extraction methods – ultrasonic probe, ultrasonic bath, hot water bath extraction – showed that vanillin extraction was most efficiently for probe-sonication using 40% ethanol (v/v) at ambient temperature of 30°C and an extraction time of 1hr. The water bath extraction required a 50% ethanol (v/v) concentration at 56°C for 15hrs. UIP4000hdT – 4kW ultrasonic extractor for continuous inline treatment. Hielscher Ultrasonics is specialized in manufacturing high-performance ultrasonic processors for the production of high-quality extracts from botanicals. Hielscher’s broad product portfolio ranges from small, powerful lab ultrasonicators to robust bench-top and fully industrial systems, which deliver high intensity ultrasound for the efficient extraction and isolation of bioactive substances (e.g. quercetin, caffeine, curcumin, terpenes etc.). All ultrasonic devices from 200W to 16,000W feature a coloured display for digital control, an integrated SD card for automatic data recording, browser remote control and many more user-friendly features. The sonotrodes and flow cells (the parts, which are in contact with the medium) can be autoclaved and are easy to clean. All our ultrasonicators are built for 24/7 operation, require low maintenance and are easy and safe to operate. A digital colour display allows for a user-friendly control of the ultrasonicator. Our systems are capable to deliver from low up to very high amplitudes. For the extraction of polyphenols and other bioactive compounds such as vanillin, we offer special ultrasonic sonotrodes (also known as ultrasonic probes or horns) that are optimized for the sensible isolation of high-quality active substances. The robustness of Hielscher’s ultrasonic equipment allows for 24/7 operation at heavy duty and in demanding environments. The precise control of the ultrasonic process parameters ensures reproducibility and process standardization. High-power ultrasonic processors from lab to pilot and industrial scale. Jadhav D. et al. (2009): Extraction of vanillin from vanilla pods: A comparison study of conventional soxhlet and ultrasound assisted extraction. Journal of Food Engineering 93, 2009: 421–426. Rasoamandrary N. et al. (2013): Improved Extraction of Vanillin 4-Hydroxy-3-methoxybenzaldehyde from Cured Vanilla Beans Using Ultrasound-Assisted Extraction: A Comparison of Ultrasound-Assisted and Hot Water Bath Extraction. The application of intense ultrasound waves to a liquid medium results in cavitation. The phenomenon of cavitation leads locally to extreme temperatures, pressures, heating/cooling rates, pressure differentials and high shear forces in the medium. 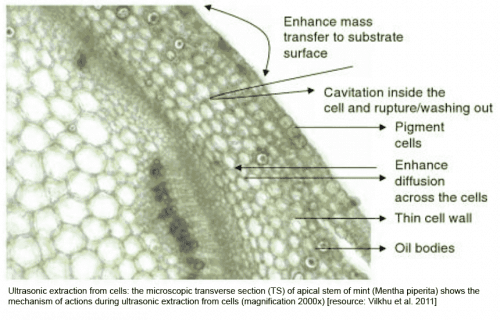 When cavitation bubbles implode on the surface of solids (such as particles, plant cells, tissues etc. ), micro-jets and interparticlular collision generate effects such as surface peeling, erosion and particle breakdown. 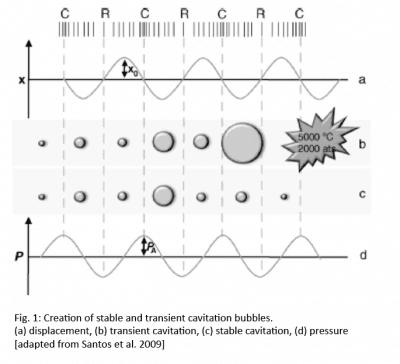 Additionally, the implosion of cavitation bubbles in liquid media create macro-turbulences and micro-mixing. Fig. 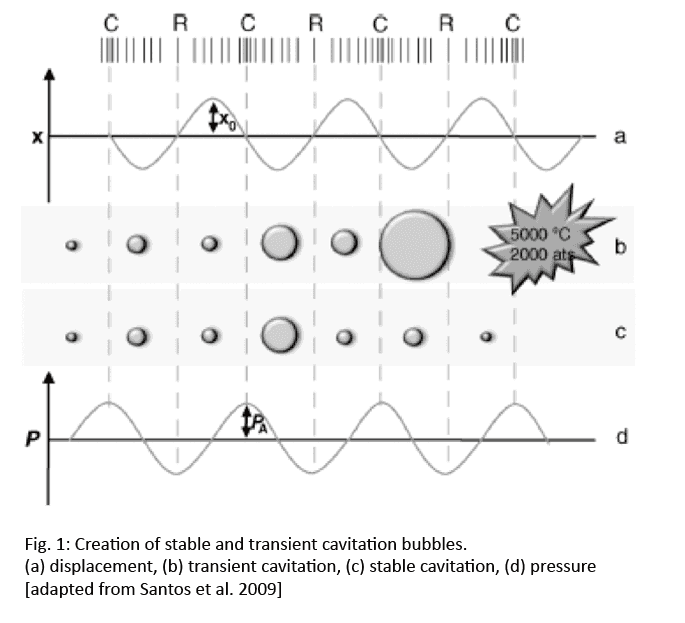 1: Creation of stable and transient cavitation bubbles. Ultrasonic irraditation of plant material fragments the matrix of plant cells and enhances the hydration of the same. Chemat et al (2015) conclude that ultrasonic extraction of bioactive compounds from botanicals is the result of different independent or combined mechanisms including fragmentation, erosion, capillarity, detexturation, and sonoporation. These effects disrupt the cell wall, improve mass transfer by pushing solvent into the cell and sucking phyto-compound loaded solvent out, and ensure liquid movement by micro-mixing. Ultrasonic extraction achieves a very rapid isolation of compounds – outperforming conventional extraction methods in shorter process time, higher yield, and at lower temperatures. As a mild mechanical treatment, ultrasound-assisted extraction avoids the thermal degradation of bioactive components and excels in comparison with other techniques such as conventional solvent extraction, hydrodistillation, or Soxhlet extraction, which are known to destruct heat-sensitive molecules. Due to these advantages, ultrasonic extraction is the preferred technique for the release of temperature-sensitive bioactive compounds from botanicals. Vanilla is a valued flavour, which can be extracted from orchids of the genus Vanilla, primarily from the Mexican species, flat-leaved vanilla (V. planifolia). The uniquely flavored compounds of the vanilla orchid are found in its fruit, which results from the pollination of the flower. These seed pods are roughly a 1/3 x 6 inches, with a brownish red to black color when ripe. Inside of these pods is an oily liquid full of tiny seeds. Both the pod and the seeds are used for the production of vanillin. Although vanillin is the primary flavour compound in the vanilla plant, pure vanilla extract contains several hundred additional flavor compounds, which contribute to its complex, deep flavor. Vanilla essence occurs in two forms, namely real vanillin essence from the vanilla seedpod and industrially synthesized vanillin. Real seedpod extract is a complex mixture of several hundred different compounds. The chemical compound vanillin – 4-hydroxy-3-methoxybenzaldehyde – is the major contributor to the characteristic flavor and aroma of real vanilla and is the main flavor component of cured vanilla beans. Besides vanillin, may other chemical compounds such as acetaldehyde, acetic acid, furfural, hexanoic acid, 4-hydroxybenzaldehyde, eugenol, methyl cinnamate, and isobutyric acid contribute to vanilla’s complex aroma. Bourbon vanilla or Bourbon-Madagascar vanilla is produced from V. planifolia plants, which grow on Indian Ocean islands such as Madagascar, the Comoros, and Réunion, formerly named the Île Bourbon. The term “Bourbon vanilla” describes also the distinctive vanilla aroma derived from V. planifolia. Mexican vanilla, extracted from the native V. planifolia, is produced in much lower quantities. Mexican vanilla is known and marketed as vanilla from the land of its origin, since the V. planifolia plant is native to Mesoamerica. Tahitian vanilla comes from French Polynesia, produced from the V. tahitiensis plant. Genetic analysis shows this species is possibly a cultivar from a hybrid of V. planifolia and V. odorata. West Indian vanilla is made from V. pompona, which is grown in the Caribbean and Central and South America.